Mess left at Cradlehall Court, Inverness in January 2018. Dirty nappies, cardboard boxes and plastic bags were left strewn across the ground near the Co-op in Crescent Court in Cradlehall. Inverness South councillor Duncan Macpherson was alerted to the mess by a local resident. He said: “They were out walking their dog and took pictures of fly tipping on the footpath between and Co-op and Caulfield Road and sent them to me. “The rubbish was down the path on both sides – black bags, cardboard boxes, household waste, toy boxes and soiled nappies. It was stuck in the brambles and plastic bags in the trees high up. 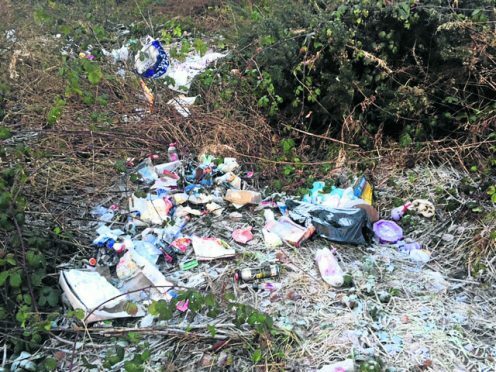 A Highland Council spokeswoman said: “Our environmental health services received a complaint about fly tipping in the Cradlehall Court area, have investigated the matter and have arranged for the rubbish to be removed. The spokeswoman added that the local authority can issue fines from £200 to £20,000 for fly tipping, and offenders can receive a six month prison term – or up to five years if hazardous waste is dumped. Police are also investigating after graffiti was written on the walls of a property in the area. Residents believe former renters within the property may have contributed to the level of disturbance in the area. A police spokesman said: “Vandalism at Cradlehall Court in Inverness was reported to Police Scotland on the morning of Friday, January 5.